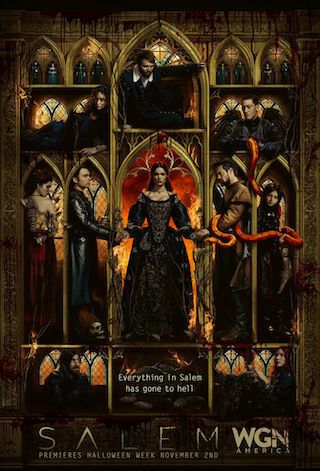 Salem is an American 60 minute scripted supernatural television series, which kicked off on April 20, 2014, on WGN America and is broadcast every Wednesday at 21:00. The show is currently in its 3th season. WGN America opted not to pick up Salem for Season 4. Salem officially canceled on WGN America. Sign up to track down your favorite TV shows. Set in 17th century colonial Massachusettsa significant time in the history of American politics, religion and society Salem brings you the real story behind the infamous witch trials. In Salem, witches are real, and they're behind it all. Salem Village and Salem Town feuded over property, grazing rights and church rights. The government was dominated by Puritan leaders. People were scrutinized closely and this resulted in obvious discord. They were afraid of being persecuted for anything that may offend the Puritan mindset. The word "witch" seemed an easy and appropriate curse hurled at someone who behaved abnormally.